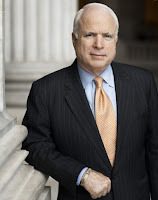 Senator John McCain (R-AZ) has authored Senate Bill 3081, which includes holding American citizens indefinitely and without trial if they are termed an Unprivileged Enemy Belligerent in the War on Terror. Obviously, this is not Constitutional and is in direct opposition to the Constitution's Fifth and Sixth Amendments. The object of the legislation is noble: keep terrorists out of federal courts and don't Mirandize them. Today, it is a grim reality that American citizens have become terrorists, are living in the midst of us, and are traveling back and forth, to and from, terrorist training camps. This is a new day in America's history. But how do we explain, former Vietnam prisoner of war, and decorated American hero, John McCain authoring this bill? John McCain, the man who vehemently opposes America's 'enhanced interrogation techniques,' which neither kills nor maimes, but would seek to take away an American citizen's right to a speedy and fair trial. "levying War against them (U.S.), or in adhering to their Enemies, giving them Aid and Comfort. No person shall be convicted of Treason unless on the Testimony of two Witnesses to the same overt Act, or on Confession in open Court. American citizens who engage in those things defining an 'Unprivileged Enemy Belligerent' (see below) could certainly be charged with adhering to our enemies, giving them aid and comfort - and...Congress has the power to declare the punishment. What's concerning about this is that the left keeps calling people like us terrorists. That brought a howl of laughter from me, and after I picked myself up off the floor, and actually thought it about, I realized she is right to be concerned. There are seven Republican co-sponsors? Senators Joe Lieberman (I-CT), James Inhofe (R-OK), Scott Brown (R-Mass), Saxby Chambliss (R-GA), George LeMieux (R-FL), Jefferson Sessions (R-AL), John Thune (R-SD), Roger Wicker (R-MS). I'll be calling Inhofe to see what he has to say, and I'll pass it on to you. If you have something to add , just let me know. SEC. 4. LIMITATION ON PROSECUTION OF ALIEN UNPRIVILEGED ENEMY BELLIGERENTS. (a) Limitation- No funds appropriated or otherwise made available to the Department of Justice may be used to prosecute in an Article III court in the United States, or in any territory or possession of the United States, any alien who has been determined to be an unprivileged enemy belligerent under section 3(c)(2).